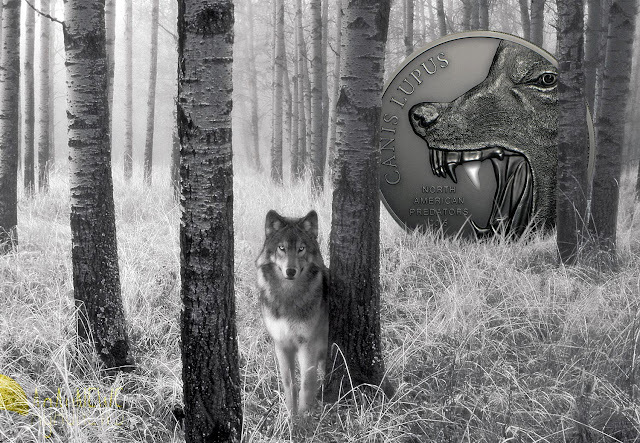 Canis lupus, or gray wolf, is an apex predator at the top of the food chain. Capable of bringing down a moose or bison unaided, the gray wolf is cunning enough to drive its prey onto ice, slopes or steep banks to slow it down. The gray wolf is the largest living species of wolf, with humans and tigers being its only serious enemies. The North American population of these once-common predators dwindled following extermination efforts in the 1930s and they have been relegated to areas within Alaska, Canada, the Great Lakes, the northern Rockies and the Pacific Northwest. They were reintroduced to Yellowstone Park in 1995, and now the Cook Islands are introducing them to Silver and coin investors as part of their three-coin North American Predators series. The 2015 Cook Islands 2 oz Silver North American Predators Gray Wolf high-relief Silver coin with an antique finish depicts the gray wolf in a state of aggression, his menacing fangs drawn and lips lightly curled. The wolf's ferocity is highlighted with a ceramic tooth inlaid by hand. 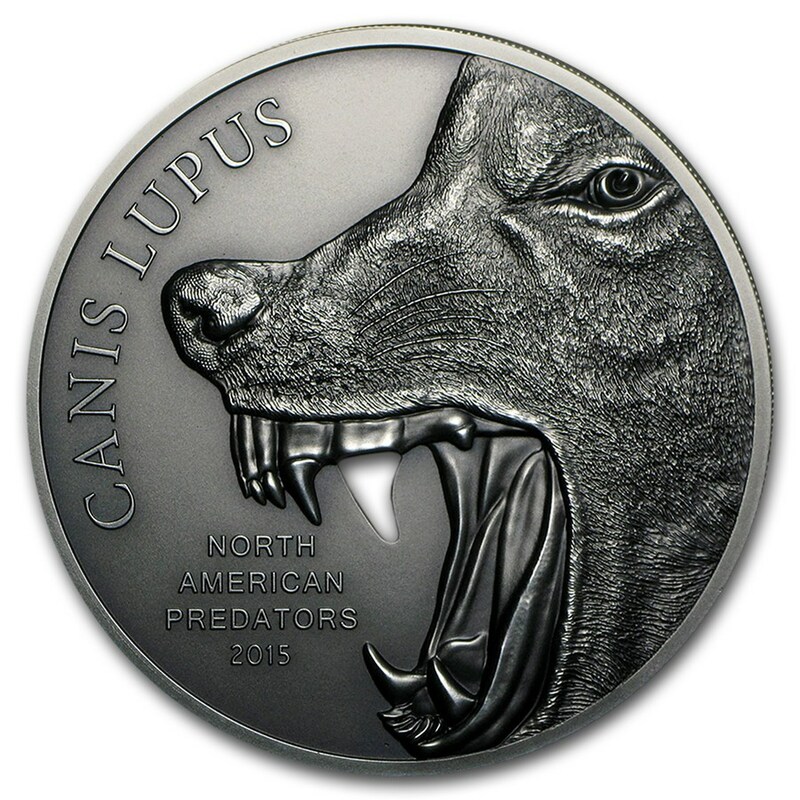 "The intense design and texture of this coin mirrors the gray wolf's reputation: a widely feared but respected creature," APMEX Vice President of Merchandising Andrew Martineau said, describing the coin. "The Cook Islands crafted a face that is as heart-stopping on a coin as it would be in the wild. Highly detailed, it is ideal for animal enthusiasts, great outdoorsmen or anyone who respects the natural order of things." As an APMEXclusive®, the 2 oz of .999 fine Silver sovereign coin backed by the Cook Islands has an extremely limited mintage of 500. 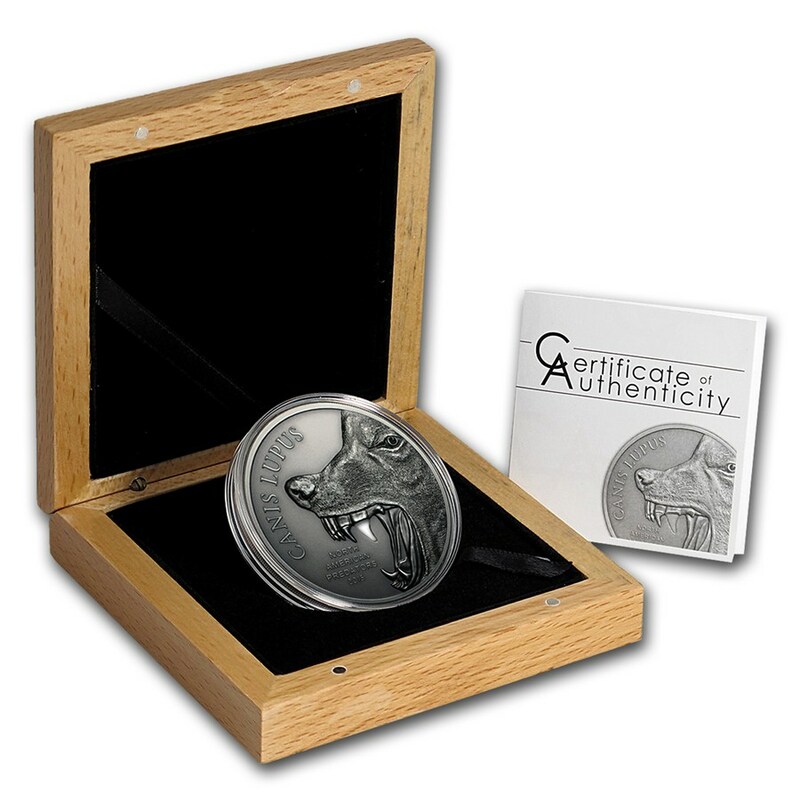 Each coin comes in a beautiful wooden box with a certificate of authenticity. 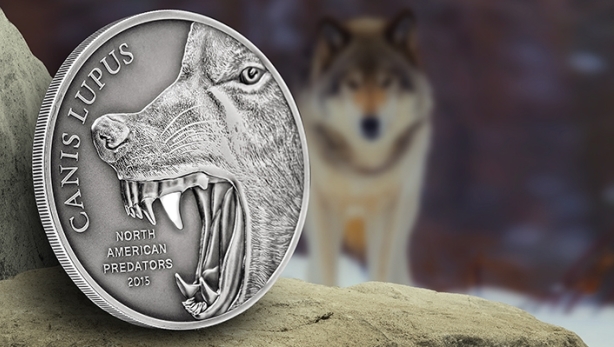 Responses to "Gray Wolf: First North American Predator Silver Coin Released to Market"
Whats the price on that? Would love one but don't know how to order one. No information given? how much? where do I get one?! Digan el valor de esta moneda y desde cuando la venderán. Where do i buy one? How much? I want one where can you buy one?